Electric Wizard is one of those bands that I’ve found never puts out a bad album. While there are full lengths in their discography that people naturally gravitates towards, each one has provided plenty of heavy grooves and a thick atmosphere that always impressed. Like most groups, Electric Wizard has gone through their fair share of changes and this has been apparent on their most recent releases. 2010’s Black Masses was a significant shift in sound, as there was an emphasis on sprawling heavy psych rather than the crushing grooves and tension of some of their earlier releases. Four years later the band has once again gone through some major changes, regaining original drummer Mark Greening for the recording of their new full length Time to Die and leaving long-time label Rise Above to form their own imprint with Spinefarm, Witchfinder Records. But these changes have also brought a good deal of familiarity with them, as this record contains some of the heaviest and darker, tension filled riffs they’ve written in quite some time. It’s a welcome return to see Electric Wizard tackle much darker content both in terms of their instrumental tonality and lyrical themes, and once you’ve had a chance to dive in to this album it will be clear that this is still the go to group when it comes to doom. Each of the band’s full lengths has utilized similar patterns, giving them an instantly recognizable sound. However, there have been nuances to every album that have made them distinguishable, and this is especially true of the three most recent full lengths. Witchcult Today took a definitive retro slant, with all of the instrumentals recorded on vintage 1970’s equipment, while Black Masses felt a bit more immediate and had even more of a heavy psych influence than ever before. 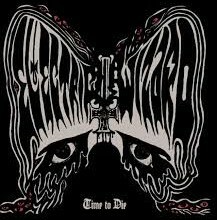 Time to Die marks a return to Electric Wizard’s darker side, as the nine tracks offered here aren’t merely content with creating a thick atmosphere and then letting it engulf the listener. Instead, there’s a feeling that these riffs are meant to fill you with a sense of dread and then when they reach a peak level cut right through you and send you off to the afterlife. The leads make an immediate impact, and while it sometimes feel like the release is a bit front loaded there are still standout moments towards the end. Songs like “I Am Nothing” and “Funeral of Your Mind” hit almost as hard as anything from Dopethrone, offering the same type of super thick, dense tonality that feels like it’s going to cave your skull in at any moment. But there’s a bit more immediacy carried over from the band’s recent efforts, as rather than going for lengthier intros Electric Wizard amps up to the heaviest level fairly quickly on these tracks. When the guitars aren’t doing their best to rip your speakers to shreds they’re exploring darker, fuzzed out riffs that have a bite to them. It’s not uncommon for doom to lull you into a trance with sprawling riffs and hazier atmospherics, but much of Time to Die is tense and foreboding with its wall of sound and it makes a significant difference. As you might be able to guess by the title of the album, the theme this time around is death. This is not only represented through the lyrics that Jus Oborn sings throughout Time to Die, but also sound clips that sound like they were taken from a news report on a murder case that has Satanic elements to it. Right from the beginning the material has a much darker and grittier feel than its predecessor, and it feels appropriate that the abrasive edge of the guitar work supports songs that discuss death. Oborn’s vocals have headed into some higher pitches over the past couple of albums, and the increased level of clarity has worked in Electric Wizard’s favor. This is once again the case, as while the vocals do sometimes step back a bit and let the pitches get sucked into the layers of sound, there are just as many moments where Oborn commands your attention. It’s not that different from what long-time fans of the group will be familiar with, but this is an element that Electric Wizard definitely doesn’t need to change as the vocal style has always suited them. There’s a consistent narrative to the album with the way the sound clips are integrated in, and it makes the material flow together as a whole rather than just feeling like an assortment of unrelated songs. It’s a little too early for me to say how Time to Die fully stacks up to Electric Wizard’s other full lengths, as I’ve found this comes over months and years for me rather than over those initial listens (I thought I liked Black Masses better than Witchcult Today when the former first came out but have since decided otherwise). But there is no denying that it is easily one of the best doom efforts of 2014, and a sign that even when the group makes slight tweaks to their formula and revisits some previous stylistic elements rather than making drastic changes they still have the songwriting to pull it off. If you’ve missed the sheer weight or tense, evil tonality from Dopethrone or Come My Fanatics this album should hit the spot. Prepare your ears and dive right in, the wait has been worth it.